I hear a lot of people ask "Where do I start?" or "How can I save?" or "How do I manage money, set up a budget, plan for the future?" and also "How do I get out of debt?" The first thing you need to know about money is that YOU control your money. Do not let your money control you! Learn how to make the money you have WORK for you. By this I mean you need to sit down and face your all of your money issues head on. This is the hardest part because for most of us it means seeing the faults in yourself. Lets face it, most Americans are in some kind of debt. It's hard to admit that you've messed up here and there and it's even harder to actually face the reality. What is the reality? That if your in debt or if you do not know where your money is going each month, then you have to CHANGE what you are doing! Change is hard! It really is, but change can be good! Don't blame yourself, kick yourself, or get down on yourself once you face the cold hard facts. These things happen. Instead, make a plan for yourself and your family. Make a plan to CHANGE your finances and CHANGE your life. If you keep doing the same things over and over..... you keep getting the same results over and over. So change is critical! If you don't save a little here and there, then you won't have a savings. If you keep borrowing money, you will keep owing money! SO, where to start? 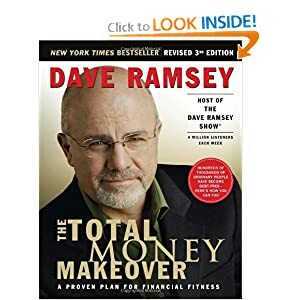 I suggest anyone who is in any kind of debt to read Dave Ramsey's The Total Money Makeover ASAP! This book is also great for anyone who is wanting to save money for their future or save for their child's education. This is an amazing book that will spell it all out to you in a very simple easy to follow format. It's a great book that will give you power over your money instead of the other way around! It's a small investment that can change your life. He offers the same advice here on Dave Ramsey's Financial Peace University DVD . After you grasp the basic principles of money mangement, you need to make your budget and stick to it! One of the largest expenses I have heard people complain about is their grocery bills. As some of you may know, I use to run a coupon blog for years. Does couponing really work? YES! I would still be blogging deals all day, but my 2 year old requires more attention now than before. Less naps, less blogging time for mommy! So yes, even though I don't run that blog any longer I stand firm in my beliefs in using coupons! I know it works because I live it! I have even written an E-Book on the subject and made it free for anyone who is interested. Head on over here to check it out now! I have made it in a blog format so that you can easily navigate from one point to the next. I tell you exactly how to use coupons and get the best deals and also when you should stock up! These ladies (and gentleman) are on top of their game and keep their blogs up to date on a daily basis. I have also found these blogs to be the most accurate in their prices. For large chain grocery stores such as Krogers, Brookshire, Albertsons, etc. I suggest to look up your local ads online. I have found to many huge price differences from region to region. It's safer to look these deals up yourself than plan a trip that doesn't work out. Learn about "Once a month shopping" and how it can slash your grocery bill in half!